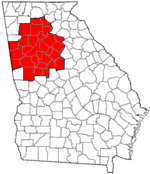 Belvedere Park is a census-designated place (CDP) in DeKalb County, Georgia, United States. The population was 15,152 at the 2010 census. According to the United States Census Bureau, Belvedere Park has a total area of 5.0 square miles (13 km2), all land. Belvedere Park emerged beginning in 1952 as a planned community with schools, parks, and a shopping center. It continued to grow and expand throughout the decade. A majority of homes in Belvedere Park are one-story and while some are traditional red brick ranch homes, contemporary style houses were also built. Adair Realty and Loan, a powerful real estate company in Atlanta during the early to mid 20th century, represented Belvedere Park. The Belvedere Motel, operated by the renowned Dinkler Hotel Corporation, opened with telephones and large screen televisions in every room. The motel claimed to be “dedicated to your traveling comfort” — additional amenities included a playground and a shuffleboard court. In 1959, the second branch of Rich's Department Store was opened in the Belvedere Shopping Center (the first branch was opened at Lenox Square Mall). Rich's added an air of metropolitan living to the suburbs. As of the census of 2000, there were 18,945 people, 6,524 households, and 4,527 families residing in the CDP. The population density was 3,801.9 people per square mile (1,468.8/km²). There were 7,010 housing units at an average density of 1,406.8/sq mi (543.5/km²). The racial makeup of the CDP was 13.16% White, 82.38% African American, 0.18% Native American, 0.94% Asian, 0.02% Pacific Islander, 1.69% from other races, and 1.62% from two or more races. Hispanic or Latino of any race were 3.48% of the population. There were 6,524 households out of which 35.3% had children under the age of 18 living with them, 31.7% were married couples living together, 31.5% had a female householder with no husband present, and 30.6% were non-families. 22.6% of all households were made up of individuals and 4.5% had someone living alone who was 65 years of age or older. The average household size was 2.90 and the average family size was 3.43. In the CDP, the population was spread out with 30.1% under the age of 18, 10.6% from 18 to 24, 32.6% from 25 to 44, 20.2% from 45 to 64, and 6.4% who were 65 years of age or older. The median age was 31 years. For every 100 females, there were 86.5 males. For every 100 females age 18 and over, there were 79.4 males. The median income for a household in the CDP was $36,144, and the median income for a family was $37,207. Males had a median income of $29,134 versus $26,323 for females. The per capita income for the CDP was $15,524. About 14.1% of families and 16.7% of the population were below the poverty line, including 23.4% of those under age 18 and 11.3% of those age 65 or over. The area is home to Belvedere Plaza, which had the second suburban Rich's department store (after Lenox Square in Atlanta), and more recently entered popular culture due to a store promoting on its signage the unusual combination of wigs and beepers. 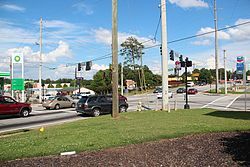 Wikimedia Commons has media related to Belvedere Park, Georgia. 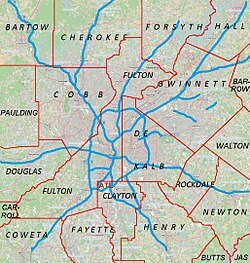 ^ a b "Race, Hispanic or Latino, Age, and Housing Occupancy: 2010 Census Redistricting Data (Public Law 94-171) Summary File (QT-PL), Belvedere Park CDP, Georgia". U.S. Census Bureau, American FactFinder 2. Archived from the original on September 11, 2013. Retrieved October 28, 2011. ^ "CENSUS OF POPULATION AND HOUSING (1790-2000)". U.S. Census Bureau. Archived from the original on July 8, 2010. Retrieved 2010-07-17.